At the bottom of the sea, volcanic and magmatic forces create hot springs that spew super-heated water into the deep sea. The hot, acidic water scours metals from Earth's crust, and the warm chemical-rich water from these remote geysers supports exotic deep-sea ecosystems. It had been widely thought the story stopped there. Metals such as iron and manganese were thought to quickly react and form particles that would either clump together or stick to other things, causing them to sink to the seafloor close to the source. But new research proves that the metals remain dissolved and follow deep-sea currents to provide a major source of iron to the world's oceans. The findings are published Thursday, July 9, on the cover of Nature. "This proves that hydrothermal activity at the mid-ocean ridges impacts global ocean chemistry of important trace metals," said lead author Joseph Resing, a senior research scientist at the University of Washington's Joint Institute for the Study of the Atmosphere and Ocean, a partnership with the National Oceanic and Atmospheric Administration. "On longer timescales, it also impacts the productivity of the oceans." Metals, especially iron, are crucial to the growth of phytoplankton in the oceans. In many parts of the ocean iron controls the growth of marine life even though it is only present at concentrations of parts per trillion. Most of the iron in the ocean comes from dust blown off deserts, or from rivers that discharge into the sea. 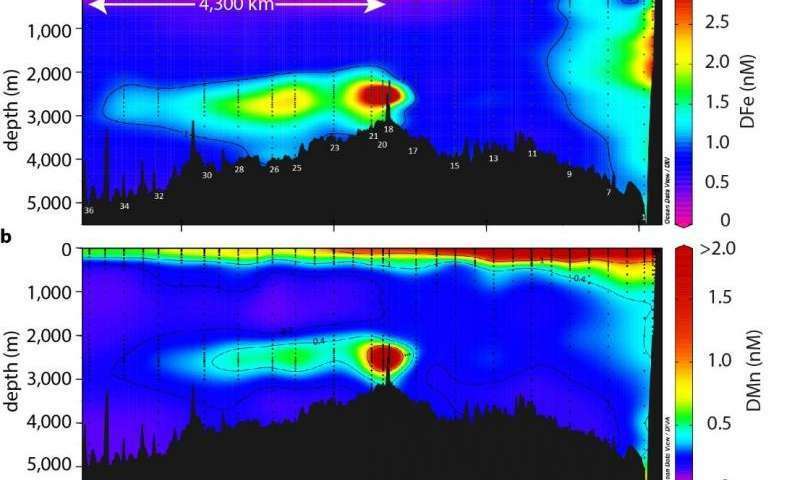 But recent research, some conducted by co-author Christopher German at Woods Hole Oceanographic Institution, hinted that iron might also be escaping from the volcanic ridge crest by exploiting some type of chemical trick to make the long-distance voyage. The new study, part of the U.S. National Science Foundation's GEOTRACES program, locates the "smoking gun"—a plume of hydrothermal metals drawn westward by a slow-moving, deep-ocean current that carries these metals for decades to distant parts of the ocean. A 57-day cruise in fall 2013 aboard the UW's research vessel, the Thomas G. Thompson, tracked water venting from the East Pacific Rise, a chain of underwater volcanoes west of Ecuador that is one of the most volcanically active places on Earth. The oceanographers followed the trail for more than 4,000 kilometers (2,500 miles) west across the South Pacific to Tahiti, using extremely sensitive tools to make measurements of the metals from the ocean''s surface to the seafloor. While the aluminum eventually petered out, every station west of the ridge crest revealed evidence of hydrothermal manganese and, surprisingly, of iron, at about 2.5 kilometers (1.5 miles) depth. "Every single day we were out there, we were surprised to see that the plume of dissolved iron was still present," Resing said. "We have never before documented dissolved iron carried so far in the ocean currents." The finding is especially important for the Southern Ocean, circling Antarctica, where massive phytoplankton blooms are known to be limited by iron supplies, and where winds are less likely to carry iron-rich dust. Co-author Alessandro Tagliabue at the University of Liverpool, England, placed the results within an ocean model and found that phytoplankton growth in the Southern Ocean is supported by iron from deep-sea vents. Iron from vent systems thus helps sustain a major ecosystem that consumes carbon dioxide from the atmosphere. Much of this carbon is exported from the ocean surface to the deep sea, and in the Southern Ocean 15 to 30 percent of this carbon export is supported by hydrothermal iron. "To properly model the uptake of carbon dioxide by the Southern Ocean and to understand how this uptake impacts climate, you must account for this iron," Resing said. Ongoing research by other collaborators will analyze additional water samples collected during the same cruise to figure out what allows the iron to be transported so far. Two leading theories are that it attaches to large organic molecules, similar to how iron clings to hemoglobin in our bloodstream, or that it separates into tiny nanoparticles that can remain suspended in the water for decades.